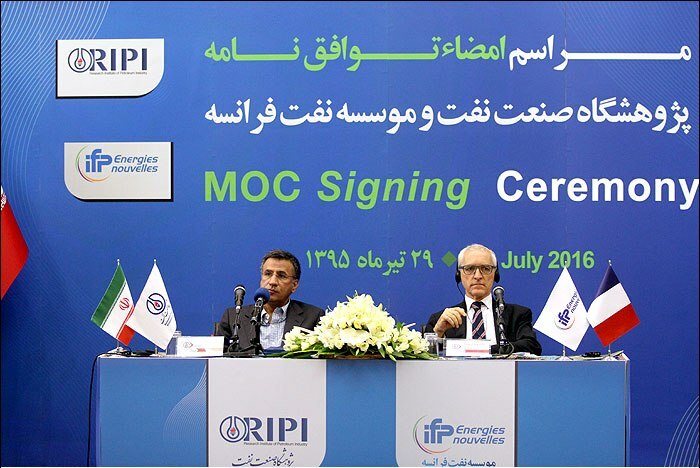 Iran's Research Center of Petroleum Industry (RIPI) and France's IFP Energies nouvelles (IFPEN) have signed a memorandum of understanding (MoU) for cooperation in 8 energy-related technological grounds. Accordingly, the two sides have agreed to cooperate in upstream and downstream areas in petroleum industry in topics like study of reservoirs, enhanced oil recovery, gas sweetening and emission of pollutants. From RIPI, Mohammad Reza Katouzian and from IFP, Didier Houssin signed the document at RIPI's headquarters in Tehran on Tuesday. Addressing a ceremony to sign the deal, the IFP official said Iran and France will cooperate on study of enhanced oil recovery from Iranian fields. "During the talks that we had, we concluded that the two sides have similar challenges in petroleum industry research and we hope such challenges will be solved by mutual interactions between the two sides," Didier Houssin said in the ceremony. He said many of Iran's oil fields are complicated ones and IFP intends to close ranks with RIPI for locating EOR methods for boosting oil recovery from the fields. "RIPI is seeking to enjoy the training programs offered by IFP," said Katouzian for his part at the ceremony. Based on the deal, the two sides have agreed to cooperate in areas such as studies over fields and reservoirs, EOR, gas sweetening and environmental areas, he added. Furthermore, IFP has agreed to cooperate with RIPI on studies over Yadavaran join oilfield. He also said that the two sides are considering signature of several deals in the future.